Full Name: Walter “Wally” Marty Schirra Jr. Received his “wings” in Pensacola, Florida, in 1947. 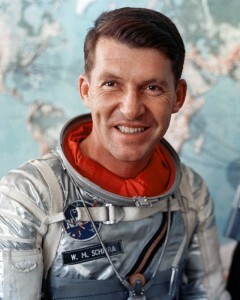 From 1947 to 1959 Schirra was a US Navy fighter pilot, Operations Officer and test pilot. Graduated US Navy Test Pilot School, Patuxent Maryland, 1958. Flew 90 combat missions in Korea as and exchange pilot with the US Air Force. Took part in the development of the Sidewinder air to air missile. October 1962, Piloted the third manned orbital mission remaining in space for a full working day. 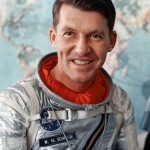 December 1965, Command Pilot of the first spacecraft to rendezvous with another manned vehicle. Commanded the first manned Apollo mission in October 1968. After NASA, became a guest commentator with Walter Cronkite on CBS coverage of Apollo missions. 1969, President, Regency Investors Inc., Denver, Colorado. 1970-72, Chairman and CEO, Environmental Control Co.
1973-74, Chairman of the Board, SERNCO Inc.
1975, Director of Technology Purchases, Johns-Manville Co.
1976, Director of Power Plant & Aerospace Systems, Johns-Mansville. 1978, Vice-President of Development, Goodwin Co. Inc.
Board member and Director of a multitude of companies in the ensuing years. Author of “Schirra’s Space”, 1988.